Nutrient deficiency in plants can trickle down quickly to your bottom line, resulting in lost crops, lower yields, and wasted resources. You know that nutrient dosing starts with water—and if your water isn't prime for your grow operation, all the nutrient dosing in the world won't be able to produce high-quality yields. However, ensuring the right nutrients are delivered at the right time can make or break your grow operation. The answer to having to manage nutrient dosing manually by regularly taking soil samples and constantly checking pH levels to avoid all of these deficiencies? Intelligent, automated nutrient dosing. Auto-dosing systems manage your grow operation by measuring pH, water temperature, and electrical conductivity (EC) levels and automatically adding in different nutrient mixes in order to adjust pH and EC levels to optimum levels. Monitoring EC is vital, because the amount of salts in the system correlates directly to the level of nutrients dissolved in the water. Equipment: You need a dosing system that dissolves or dilutes fertilizer concentrates to their proper feed strength and a means of getting those nutrients into the irrigation system. Application: You need to have a way to uniformly and consistently deliver feed solutions to the root zone throughout the crop. Consistency: Having the best equipment and means of application is useless unless you also have a consistent and repeatable method for dissolving/diluting fertilizer concentrates. 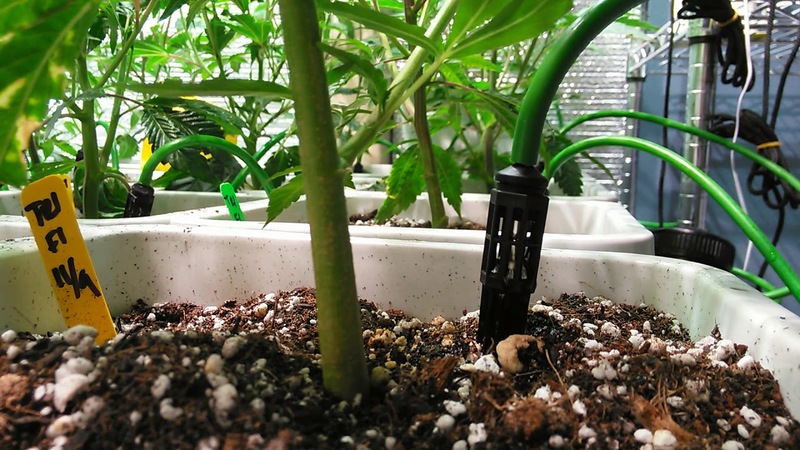 There are two main dosing methods used in grow operations: dilute tanks and in-line injection. Although dilute tanks offer the simplest form of nutrient dosing, these systems are costly and only one formulation/concentration is available at any given time unless you invest in multiple large tanks. Because fertilizers are premixed and stored in a tank until needed, if you need to adjust the formulation/concentration, you must wait until the tank needs to be refilled, which can waste precious resources. In-line injection offers more flexibility and customization, and is the most popular form of nutrient delivery. These systems work by continuously “injecting” concentrated stock solutions into the water stream as irrigation takes place. Depending on the injector’s design, mixing often occurs downstream in the irrigation system or in a mixing tank. In an automated in-line injection system, the amount of nutrients delivered will vary based on flow rates and/or sensor feedback on EC and pH levels. One of the biggest benefits of an automated in-line injection system is that the system can automatically turn on a dime to alter the solution to adjust feed recipes, change nutrient concentration for varied crops, or alter feed strength as the day goes on. Automated dosing systems are great for large and small operations, especially because smaller systems often experience greater nutrient level fluctuations than larger systems. The Growlink Smart Dosing Controller is a multi-feed injector system that offers a management solution for pressurized in-line injection and dilute tank applications. This nutrient dosing system includes probes that measures pH, temperature, tank water levels, and EC, giving you the power to program the values you want your system to maintain to keep your operation in perfect balance 24/7/365. Download our Next Level Grow e-book now to find out how you can efficiently battle nutrient deficiency in plants and change your growing game.